George introduced us to a new segment of the Arizona Trail, the Gila Canyons passage, which starts at a newly constructed trailhead just outside the town of Kelvin. 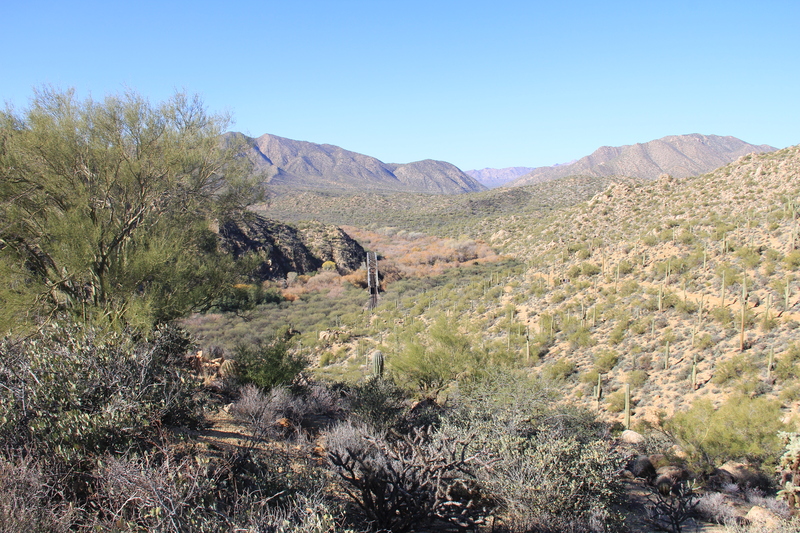 This segment of the Arizona Trail (which stretches some 700 miles from Mexico to Utah) heads westward and then north for some 25 miles to the PicketPost trailhead near Superior. No, we didn’t hike the entire 25 miles, but treated it as an “out and back” of some 6 or 7 miles round trip. 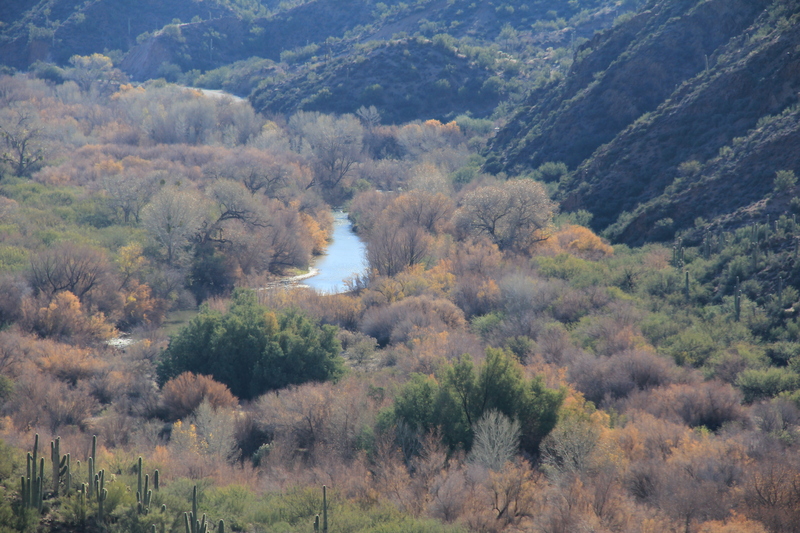 The portion of the route which we hiked starts near the river level (Gila River) and meanders about 2.5 miles up a ridge line along the river course until it peaks out perhaps 700 feet above the river, then drops back down to river level in an open wide valley. This trail segment is recently built, and is in excellent shape, perhaps the best we’ve ever encountered. The layout takes best advantage of the terrain and the surface is near-sidewalk smooth, allowing you to enjoy the scenery rather than constantly checking your footing. Thanks, Arizona Trail Association! 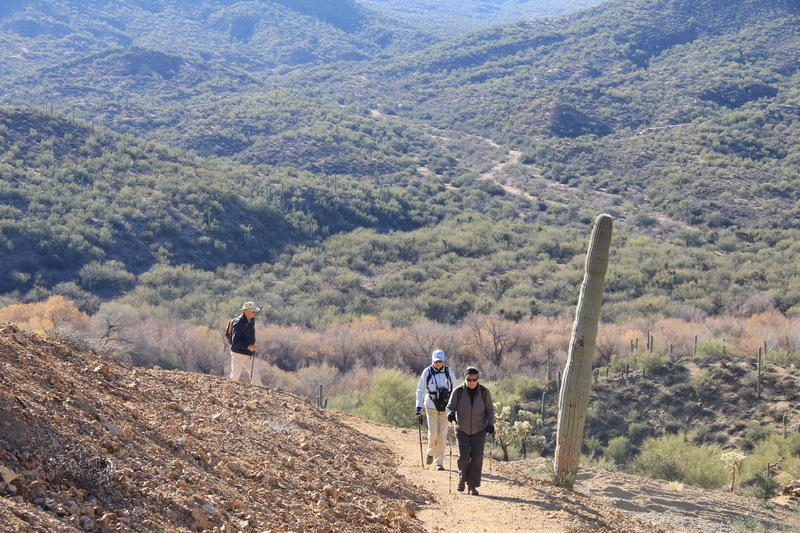 The Arizona Trail Association is a non-profit group of volunteers who work to construct and maintain the Arizona Trail network. You can read about them at http://www.aztrail.org. 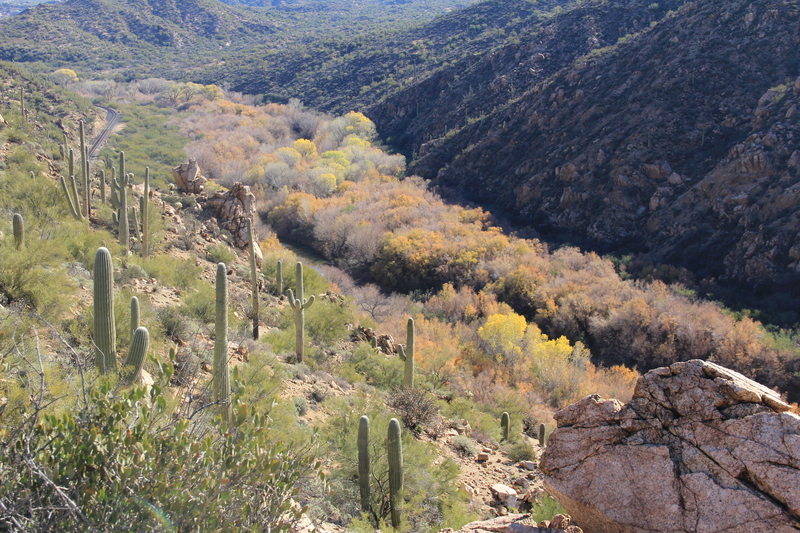 If you hike in Arizona, you have benefited from their work. Consider becoming a member and/or volunteer to help them in trail construction/maintenance projects. The visual attraction of this hike is the Gila river, flanked by the color of cottonwood and aspen all along it’s length. 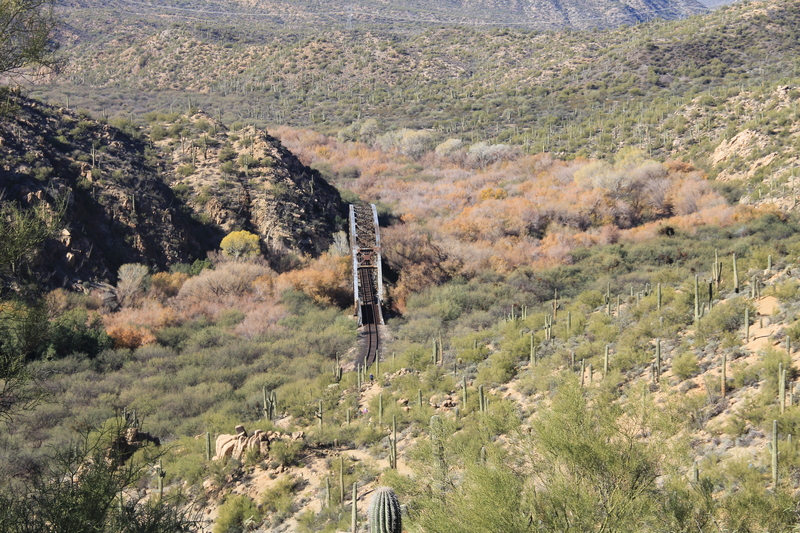 A railroad, serving the nearby Ray copper mine, follows the river. 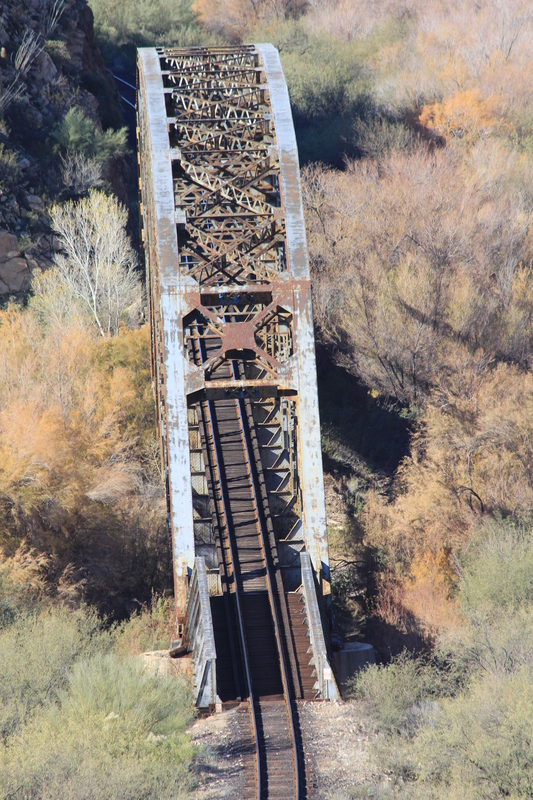 Santa brought me a new Canon 60D DSLR camera, along with an additional 300mm long lens, so I used this railroad trestle to experiment with my new toy. The following sequence of three shots were all taken standing on the same spot along the trail. Thank you, Santa! Hopefully I can take advantage of the capabilities of this instrument. 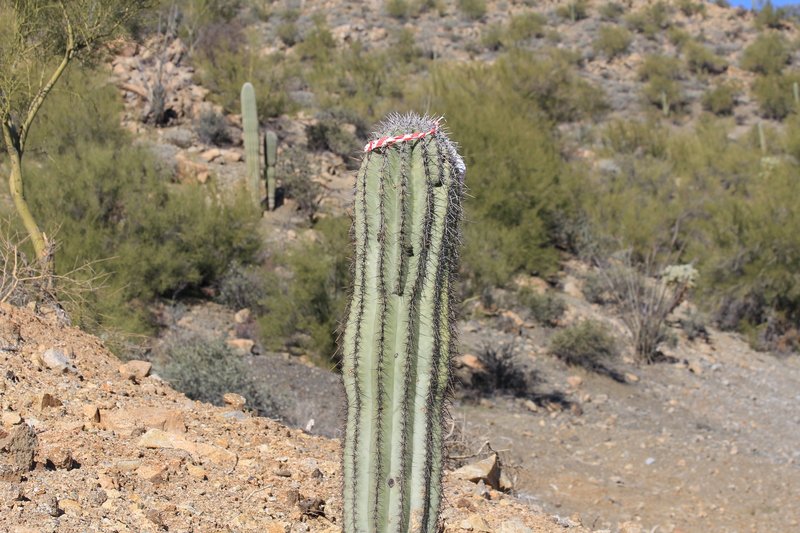 I have no idea why someone put a red and white ribbon atop this juvenile saguaro? Another curiosity that I noticed along the trail…. 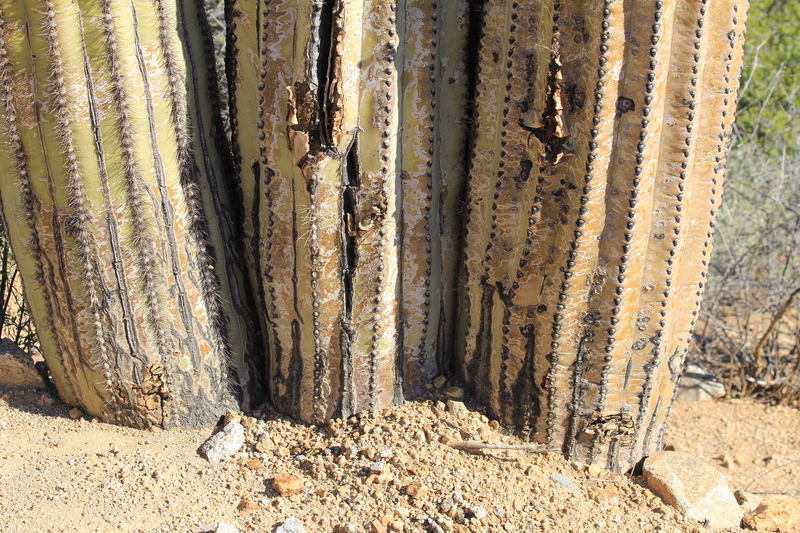 usually saguaro cactus stand a polite distance from their neighbors, in order that their root web can absorb as much scarce moisture as possible without competition from another saguaro. In contrast to that common situation, these four mature saguaro clustered together seem to be seeking protection from some enemy. Their trunks literally touch at the base. It was a nice hike on a cool day, George. Thanks for leading us here. 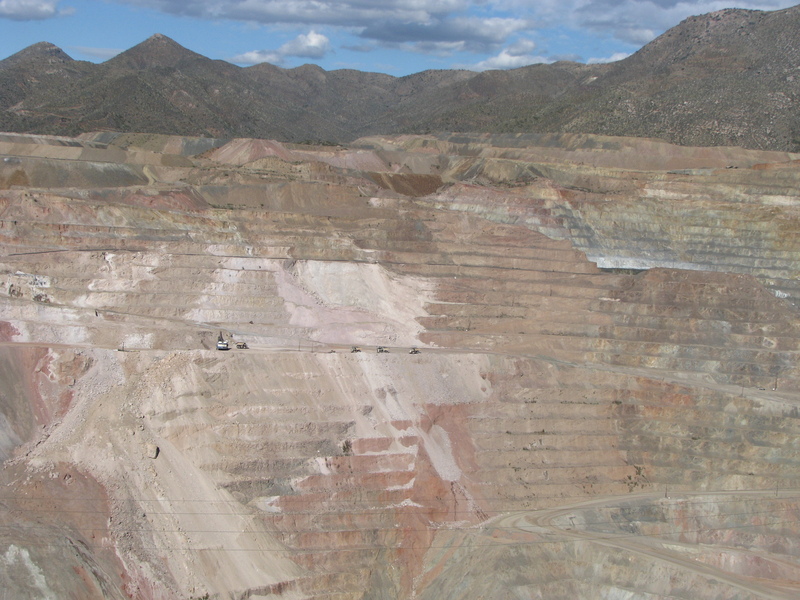 As a final note, this part of Arizona is copper country, and the nearby Ray Mine is huge. If you haven’t been there, stop at the visitor viewpoint after your hike. The entrance is just a few miles north of Kelvin on route 177 on your way home. 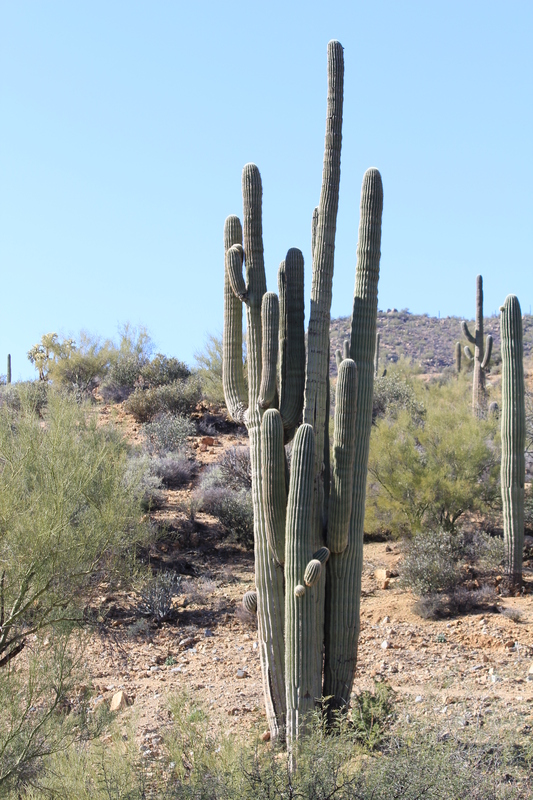 No crested saguaro photos? Love what your new camera can do! I am glad it was a good, new hike. Doesn’t a beribboned cactus count? How many pictures of THAT have you seen before, huh? Nice pictures, Hans. I didn’t know Santa was so nice to you this year – – would love to see your new camera/lens sometime! Santa gve you the most “perfect” gift. Not only will you be able to enjoy it, we as well will.